So, what exactly is this 'blog' all about? 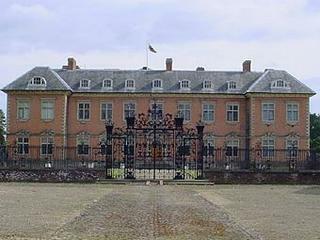 It is, as the name suggests, about Tredegar House, a glorious 17th century mansion which was once the centre of a mighty estate and the home of the one of the most ancient of all Welsh families, the Morgans. The Morgan family sold the House in 1951 to an order of Roman Catholic nuns and it was run as a school for 23 years. It was in 1974 that the local authority, Newport Borough Council (as it then was, before they became city-slickers) bought the House and the 90 remaining surrounding acres of parkland, and began the long and laborious task of restoring Tredegar to something like its former glory. That task continues to this day. Tredegar House is a country house back from the dead. It is rightly seen as the jewel in Newport's crown. Its red brick facade (which seems to glow when hit by the sun) is a splendid sight, and its unique features, make it one of the most important Restoration houses in Britain. Outside, the lake (known as the 'Great Pool' when it was first dug in 1791) shimmers as swans glide imperiously across the water. The magnificent stables, looking like a mansion in their own right, stand as testimony to the Morgan's passion for both horses and grandeur. Inside the house, portraits of long-dead Morgans peer down at the visitor. Their stories amaze, beguile and intrigue to this day. In this blog I hope we can discuss both the history of the house and of the family. There are many stories that people half-know, and I hope to address them all in this blog: Didn't one of the Morgans survive the Charge of the Light Brigade? Why did Lord Tredegar bury his horse in the garden? Didn't one of them have a parrot on his shoulder? Was a Morgan at the Battle of Bosworth Field? Didn't Lord Tredegar own a gigantic yacht? Who exactly is that statue of a man sitting in a chair near the NatWest bank in the centre of Newport? Didn't one of them build bird's nests as a hobby? Wasn't one a pirate?.....there is so much to discuss. This blog will also be used to provide updates on Tredegar House: news on upcoming events, restoration projects, the latest research and theories, and a lot of babble from me. I hope readers find it of some interest. Comments are always welcome. Good luck with the blog. Have visited Tredegar House many times at Christmas! It is always a pleasant experience to visit Tredegar House and Park - everything is so well looked after.If only we could say the same about Ruperra Castle! As a former guide I have to say its good to see the house once again appearing on the net. I fine job sir! Evan would be proud of you. All you need is a few more parrots! The House still mourns your loss, sir. As for parrots, be patient, they are coming, whole flocks of them, with perhaps the odd owl and boxing kangaroo thrown in for good measure! Just wondering Tredegar House has a connection with Tredegar Square in East Londons borogh of Bow? There is even a pub just near its north east corner called the Morgan Arms, is there a connection?